New members: Abdul (left) and Bakke now sit on the board of E&O. 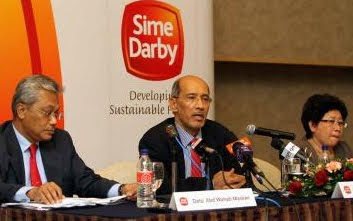 PETALING JAYA: Sime Darby Bhd's move to appoint two of its top executives - president and group chief executive Datuk Mohd Bakke Salleh and group chief operating officer Datuk Abdul Wahab Maskan - to board positions at Eastern & Oriental Bhd (E&O) has elicited both positive and neutral responses from analysts. E&O told Bursa Malaysia in a filing on Tuesday that it was appointing Bakke and Wahab as non-independent and non-executive directors. It also announced the resignation of non-independent and non-executive director Thomas Teo Liang Huat. A local bank-backed analyst said it had been expected that Sime Darby would place board members at E&O following its purchase of a 30% stake in the latter in September. StarBiz had previously reported that Sime Darby would appoint two people to E&O's board after it bought into the Penang-based niche property developer for RM766mil or RM2.30 per share from Tan Sri Wan Azmi Hamzah, Singapore-listed GK Goh Holdings and E&O managing director Datuk Terry Tham. The acquisition, which sparked discontent among minority shareholders for the 60% premium-to-market price paid to the three parties for their shares, prompted a review by the Securities Commission into whether there was collusion involved in the share sale and if Sime Darby had to make a mandatory general offer for the rest of E&O's shares, but the regulator ruled otherwise. Sime Darby, now E&O's single largest shareholder, also signed a three-year agreement with the latter to cooperate in three areas - sharing knowledge and expertise, leveraging on each other's core competencies, and jointly exploiting economic opportunities. While Sime Darby has reiterated that it did not buy into E&O with the intent to merge, Bakke had told StarBiz that he would not rule out a general offer and might make one if it was appropriate. Previously, the ECM Libra Financial Group Bhd, which currently has a 6.4% stake in E&O according to Bloomberg, had attempted to get two of its representatives - Mahadzir Azizan and Leong Kam Weng - to the latter's board during its AGM but failed to do so after shareholders voted in opposition. Meanwhile, E&O has posted a 172.1% surge in net profit for its second quarter ended Sept 30 to RM13.8mil from RM5.1mil in the previous corresponding period on the back of 25.5% higher revenue to RM82.6mil from RM65.8mil. The developer attributed its strong results to higher revenue from the Seri Tanjung Pinang project as well as the hospitality and restaurants division, but said it would adopt a “cautiously optimistic” outlook against the present economic uncertainties. It added that earnings could be boosted by its property development projects such as the St. Mary Residences in Kuala Lumpur, Quayside Seafront Resort Condominiums at Seri Tanjung Pinang and new launches in Penang. E&O's first board meeting with Sime Darby's representatives in attendance was held yesterday. PETALING JAYA: SP Setia Bhd has won the bid to develop Chestnut Avenue, an 18,700 sq m parcel of land in Singapore, for a total tender sum worth RM437.40mil. In a filing with Bursa Malaysia yesterday, the company said that its unit, SP Setia International (S) Pte Ltd, had won the bid. SP Setia said the land tender would be granted a lease term of 99 years and was to be developed into condominium or flats. The tender sum would be satisfied in cash via a combination of internal funds or bank borrowings and to be completed during the financial year ending Oct 31, 2012. The land is connected to major arterial roads and expressways such as the Bukit Timah Expressway, Pan Island Expressway and Upper Bukit Timah Road. “It is also located near the Petir LRT station as well as two future Mass Rapid Transit stations, namely Cashew and Hillview. “These two stations are part of the future Downtown Line 2 to be completed in 2015 connecting the land to key precincts in the city centre. “Amenities like Lot One, The Rail Mall and Bukit Timah Plaza are all located close to the land,” it said. SP Setia said it intended to build an eco-themed development comprising residential apartments with an estimated gross development value of RM1.1bil. It intended to launch the project in the fourth-quarter of 2012. “The proposed project is expected to span a development period of three to five years. At this preliminary stage, the total development cost and the expected profits to be derived from the project have yet to be ascertained,” it said. The tender represented SP Setia's second foray into the Singaporean property market following its acquisition in April this year of a freehold development along Woodsville Close. GEORGE TOWN: A deal for a developer to redevelop one of the state’s oldest landmarks on Penang Hill — Crag Hotel — appears to have stalled, due to an alleged exclusion of surrounding properties in the hotel’s vicinity. Business Times has learnt that although Sri Nisuh Sdn Bhd had been initially promised several bungalows adjacent to the historic hotel when the contract was discussed, the said bungalows did not find their way into a draft agreement. “Three bungalows adjacent to Crag Hotel were promised to be integrated into a memorandum of understanding between the Penang authorities and developer,” a source said. In May, the state government announced that Amanresorts International Pte Ltd will run the famous Crag Hotel on Penang Hill, which was one of the earliest hilltop homes and later turned into a hotel in 1929. Chief Minister Lim Guan Eng was quoted at the end of May as saying that redevelopment project will take off after an agreement is inked between the developer and the state government two weeks after he made the announcement. Three months ago, Amanresorts’ media communications manager Anjali Nihalchand said that the firm would be forwarding its proposal to the state’s Chief Minister Incorporated on September 5 for final approval. When contacted yesterday to enquire on the status of the approval sought from the state authorities, Anjali said in an email that there were no current updates as “this is still at its very early stage and we have not got anything further to share at the moment”. State Seccretary Datuk Fariz Darus did not respond to an email enquiry from Business Times. The Subang Jaya Municipal Council (MPSJ) will call for a discussion with residents to address the issue of a proposed revision for a development project in PJS 7, Bandar Sunway. MPSJ president Datuk Asmawi Kasbi said the details of the discussion would be decided by the MPSJ’s Urban Planning Department, but it was tentatively scheduled for January next year. “Developer Ceria Pujangga Sdn Bhd had submitted an application to revise the planning permission for the layout plan for the project,” he said. The developer had submitted an application to revise the layout plan for two multi-storey blocks by increasing the number of residential units. According to the minutes of the MPSJ’s One-Stop Centre Committee’s meeting, the proposed revision would have 629 Soho units compared with 166 service apartments at one block, and 332 service apartments compared with 166 service apartments at another block. Councillor R. Rajiv highlighted the issue at the MPSJ full board meeting, citing residents’ concerns of the expected increase in traffic should the revised project be approved. He suggested that MPSJ delay the approval for the application to revise the project, pending a discussion with residents to address their concerns. Councillor K. Arumugam, who sits in the MPSJ’s One-Stop Centre Committee, said construction for the project had commenced with one block having completed its foundation process. Asmawi explained that the developer probably wanted to revise the project due to its proximity to Taylor’s College, hence the revision to cater to the student population. “The MPSJ will call for a discussion with the residents and explain about the revision,” he said. “From there, a decision will be made as to whether to allow the project to continue or bring the matter to the State Planning Committee.” On the status of approval for the project, Asmawi said it remains status quo as per the originally approved plan.